Can you believe Thanksgiving is only a month away?!? As we quickly approach our favorite time of year, we’re taking stock of the butler’s pantry and linen closet and planning out all the detailing surrounding the main meal itself. For us, melamine is an entertainer’s dream… It looks high end, but is practically indestructible! And appetizer time is an ideal time to set these pieces out. Your guests will be milling around visiting, snacking, perhaps cooking and the last thin you’ll want to worry about is a chipped or broken dish. This chip and dip set and appetizer plate set by Le Cadeaux would be a beautiful start to your meal, and practical to boot! Gorgeous taper candles are an amazing way to really amplify your tablescape. Forget the boring white candles, these high fashion tapers will offer a while new dimension and additional sparkle. Made with the finest beeswax, these candles have a burn time of 11 hours, so your Thanksgiving dinner will be all aglow, as will the next day’s brunch. You’ve got your china and your serving pieces all squared away. But, how about those tabletop accent pieces that say you’ve thought of each and every detail. It’s these pieces that help guests feel at home and encourage lingering… This small, 8″ tray by R. Wood Studio is so versatile – be it cheeses, olives or other charcuterie, these tiny nibbles are an ideal accompaniment to any celebratory meal, and this little dish is the perfect vessel! Next, a few smartly placed white marble salt cellars (yes, the gold spoon is included ;-)) will show guests no detail was overlooked and their comfort is paramount… down to ensuring perfect seasoning for each plate. And there’s so much more we have to offer all the entertainers out there both in-store and online via the new steve mckenzie’s website. We’d love to have the opportunity to help you select the ideal pieces to make this holiday special or even pick the perfect hostess gift if you’ll be celebrating outside of your home! We’ve been experiencing some very chilly weather here, and if you’re like us, looking to hibernate and stretch out Valentine’s weekend a bit, look no further than this fabulous recipe for Vanilla Fudge… After all, as you can see from the photo below, it’s the perfect “Rx” for whatever ails you! This recipe is shared by our great friend and steve mckenzie’s team member, Kim Crosby, whose mother is always “in search for the next best recipe.” She and her sister love the fact that it’s written on their mother’s eye doctor’s prescription pad, and must be at least 35 years old! A classic for sure!! Bring all of these ingredients together in a mixing bowl, and beat well, until all is incorporated. Transfer to a heavy-bottomed sauce pan and stir, continuously over medium/medium-high heat until the mixture boiling and has reached 232°F, when checked with a candy thermometer. Pour into a buttered dish (an 8×8″ cake pan works well) and cool completely. Once cooled, slice with a thin knife and enjoy! A big thank you to Kim for sharing this favorite recipe of her family’s and for the fun story accompanying it! Wishing you all warm thoughts and vanilla fudge filled dreams! Once you’re up and about, we invite you to visit the steve mckenzie’s showroom and take a look at some fabulous new finds we’ve recently brought in. We think they’ll have you looking even more forward to Spring! We had so much fun pulling together these Valentine’s table settings, and we think you’ll have even more fun pulling them off for yourself and surprising your loved one with a special dinner at home this holiday! Sure, there’s something about a night on the town, but does it have to be on Valentine’s day? The crowds, prix fixe menus… We suggest saving the big night out for another evening and celebrating at home. After all, it’s more cozy and comfortable and with the right tablescape, you can set the mood however you like! First up, a casual supper setting. Perhaps you’ve just started dating, so you don’t want to go overboard just yet. This place setting featuring Libeco linens, a Match Pewter Dinner Plate, R. Wood Studio Dessert/Salad Plate all topped off with a silver heart ornament (could double as a sweet gift!) by Eric Cortina, offers a sentimental feel where a classic french bistro meal such as croque monsieur and a simple salad would be perfectly suited. Also featured in this setting is an R. Wood Studio Small Scallop Bowl, Two-Piece Salad Set, in red glitter, a Tart/Pie Server, also in red glitter, a simple red spreader, an Acrylic Dolce Vita Water Goblet and Tumbler and Vintage-Style Flatware. With this setting, things are getting a bit more serious… Although they’re kept casual with the Acrylic Lente Tumbler and Highball glasses and white Vintage-Style flatware. The le Jacquard Francais tea towel, turned place mat and Libeco Linen napkin, both in tones of strawberry and red give a nod to the holiday celebrated. But it’s really the Match Pewter Convivio dinner and salad/dessert plates that elevate this setting. The three heart ornaments by Eric Cortina offer a little something special, while also doubling as a gift. Finally, with our third setting, we’re looking at a proposal-ready tablescape, so beware! This is your classic Valentine’s surf and turf place setting… It’s grounded by a tea towel place mat by Le Jacquard Francais and an April Cornell Essential Napkin in pink. The dinnerware is a combination of Match Pewter Viviana Dinner and salad/dessert plates and a bread a butter plate in Royal Crown Derby‘s Mikado pattern. This tablescape’s crowning glory is the Royal Crown Derby, Mikado coffee/tea service – it’s even more stunning in person! Also featured in this table setting are the Acrylic Dolce Vita Water Goblet and Wine Goblets, and Vintage-Style Flatware in Black. Add a few flowers and some candles, and this tablescape will be over the top! We’ve been fans of Rebecca Wood’s work for many years now. And certainly, you’ve heard us mention our favorite pottery from R. Wood Studio. Located right up the road in Athens, GA, R. Wood Studios brings us some of our most popular dinnerware pieces. In addition to her pottery, Rebecca has also agreed to share some of her beautiful art pieces at a show in our new space! Going September 18-20th, the Rebecca Wood Art Show at steve mckenzie’s will feature some of her most mesmerizing botanicals. growing up, i spent all my days in the woods around my home. i was always exploring creeks and observing nature and all its variety. i grew up ‘looking’,and that has informed all my art. i still take long walks in the woods observing the beautiful patterns and colors in nature,and derive most of my inspiration from the abundant southern flora. ideas for shapes, textures and colors are everywhere in nature. thus, it was natural to be drawn to red clay and reproducing the varied colors in our southern landscape with my pottery. drawing and photography are my ways to study the forms and colors in nature. but nothing is as primal as drawing from life, really looking and really studying a flower or a branch is a learning experience that is very satisfying. i hope through my work that people will gain their own understanding and appreciation of the beauty that exists all around us here in the south. We hope we’ve inspired you to stop in soon and experience Rebecca’s art in person! And, please share – what space in your home could you see a Rebecca Wood original fitting in? We’re seeing RED… Give back by shopping! Beautiful pieces, perfect for February (and really any month) from our collection by Grandmother’s Buttons! 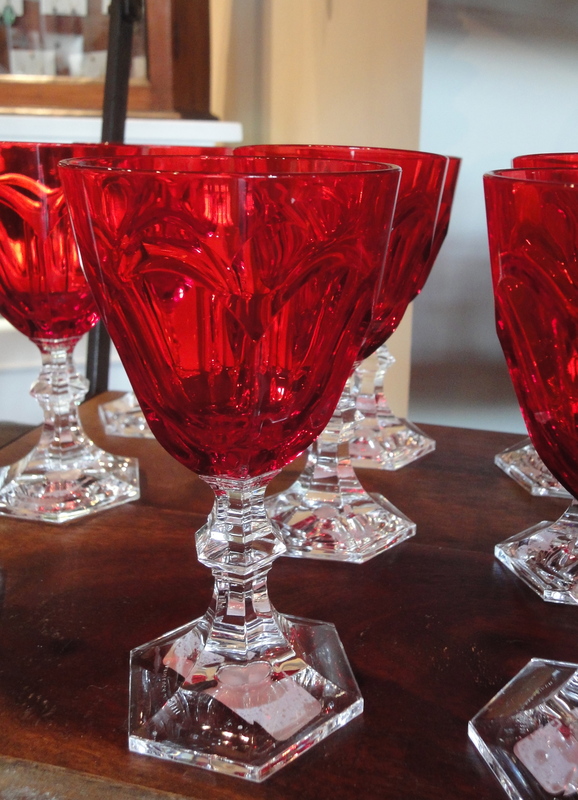 Italian Acrylic Glasses – Valentine’s Day picnic anyone? 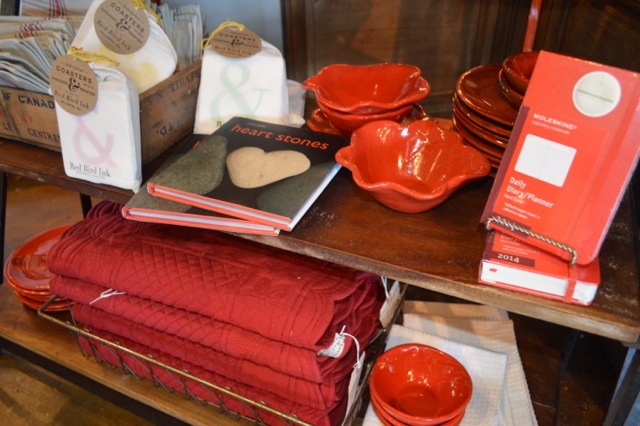 A portion of our new vignette here at steve mckenzie’s, featuring many red items, including table linens, a rich red Moleskine daily planner, and some of our favorite R. Wood Studio pottery, in Poppy Red. As many of us and/or our loved ones are affected be heart disease, it’s important to grow awareness and become educated on what we can do to better our heart health. Check out this article from the Center for Disease Control (CDC) on ways you can become more heart healthy. Through education and donations – like yours, when you shop at steve mckenzie’s – we can help make a difference. Thank you for your support this American Heart Month, and every month; here’s to heart health!